For those fans of The Dungeon Comic, or those that have never checked it out, take a look at The Dungeon Documentary: The Comic Art to Making an Indie Epic Trailer. The Dungeon Documentary: The Comic Art to Making an Indie Epic is an in-depth look into the life of artist Shawn Harbin and his comic book series The Dungeon Comic. For 6 years Shawn has been toiling away at creating and self-publishing this epic 9 issue mini series. A lot of people do that, but what makes this comic unique is not only is its grand scale of more than 500 pages, but he did all the work on his own. 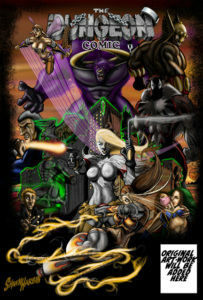 The comic itself is a mixture of genres including, mystery, fantasy, horror, action, and humor. Through much tragedy and loss, he’s had every reason to give up, yet continues working on the book. The Dungeon Documentary exposes the hardships and successes of working indie while trying to make a mainstream living. Part instructional, part human interest, and part inspirational anyone wanting to work in comics should see this film. So you are probably thinking, “what will I get out of this flick?” The documentary interviews various individuals in the comic industry including Marvel Inker Jay Leisten(Death of Wolverine/Uncanny X-men) Artist Dawn Griffin (Zorfbert and Fred), Underground Comixxx Artist Jabaar L. Brown. Editors Enrica Jang from Red Stylo press (Shakespeare Shaken/Killer Queen) and Philip Hopkins (Brotherhood of the Dwarves) fetish model Miss V, Actress/Producer Dana Michael (Mancation/Flogging Margaret), Authors Sheryl Steines (She-Wulf/Day of the first Son) John Dawson Jackson (The Relics/The Rise and Fall of Empire: A Love Story) and Stephen J. Semones (Gloom) talk about what makes The Dungeon Comic great.